Keen to get your kids into composting? Great! Composting is fun and is ready for anyone, anywhere. Making compost is appealing to a wide range of ages. Composting is not only great for the environment, it is also an awesome science experiment that can help kids learn more about biology, life cycles, recycling, conservation. Composting is a natural process of decomposition and recycling of organic material (such as leaves, grass, fruit and vegetable scraps) into a rich soil amendment known as compost. You can teach kids about this circle life and teach them how to complete it. It’s also important to teach kids the basic principles of taking responsibility for the waste they generate through recycling and composting. Making composting for kids a hands-on science experience! For kids, it will just seem like great fun. In this article, we’re going to guide you through the ins and outs of composting and how to compost with your kids. We hope that this guide can help you, as a parent or teacher, boost your knowledge of the topic so that if the situation ever presents itself and your children ask you a more loaded question, you’ll know just what to say. What do Kids Learn Through Composting? Composting raises Kids’ environmental awareness – Composting is a great way to raise kids’ awareness of the environment by teaching them how to reduce waste. Kids learn through direct experience that they can make a difference and have a positive effect on the environment. Composting also helps kids understand the three environmental r’s (recycle, reuse and reduce). Kids learn the difference between compost and what ends up in our landfill. Kids learn what waste can be used for composting. As kids get older, they learn about the impact of the three environmental r’s on the earth. You can turn collecting compostable waste into “seek and find” compost game or involve your kids in the kitchen by teaching them what kind of kitchen scraps to save for composting. Composting Teaches Kids Science – Although composting is simple (you just put organic matter in a compost pile and wait for it to decompose), it is a wonderful introduction into the world of science especially biology, chemistry, and physics. When kids put their organic materials into the compost pile they become curious about what will happen next. Without even realizing it, kids are learning the basic steps of the scientific process by monitoring the natural process of decomposition and recycling of organic material. Kids learn which organic materials called “Nitrogen materials”, which called “Carbon materials”. Kids learn the importance of bugs and worms and their value to our ecosystem. Kids learn how different materials breakdown by understanding the chemical process and they even learn how temperature works in the decomposition process. Composting offers wonderful science lessons right at home! Composting Teaches Patience – Patience is virtual, and with composting, it is very important to understand that the process of decomposition can take a while. Kids have to learn to be patient when waiting for their materials to decompose. The waiting actually makes the moment they see their own biodegradable products even more exciting! Composting is not a mysterious process. Natural recycling occurs on a continuous basis in the natural environment. In a forest, dead leaves fall forming the mulch that protects the soil. Over time, they decompose into nutrients which are returned to the soil to support plant growth. Composting is a natural biological process of recycling organic materials such as food waste, leaves into a dark brown, crumbly soil that smells like a forest floor. It’s amazing nutritious for your garden and lawn. In this process, various microorganisms, including fungi, insect, and bacteria, decompose organic solid waste into simpler substances. As these beneficial microorganisms decompose organic waste they produce heat, which is why compost piles often warm and can even be seen steaming in cold weather. Under optimal conditions, a compost pile can heat up to temperatures in the range of 50-65 °C (120-150°F). Kids conducting composting experiments can use daily temperature readings to compare how quickly the compost heats up, how hot it gets and how long it retains its heat. If you’re a teacher, you can even make this into a competition, for instance, to see whose pile reaches the hottest temperature or stays hot the longest. If you want your compost to heat up, then some knowledge of the decomposing process is important. Chemistry is important in this natural process because for quick microbial growth, you need to add the right mix of carbon, nitrogen, and water. Physics also plays a role in composting because physical characteristics of the compost ingredients, including particle size and moisture content, affect the rate at which composting occurs. There are various reasons to make compost. Save resources, save money, reduce our impact on the environment and improve your soil. While it may take a little time to set up your own composting system, the results will be worth it. After a few months, you get a free natural fertilizer for your plants to keep them looking healthy and beautiful. Here’s why: When our waste is sent to landfill, air cannot get to the organic material. Therefore as the landfill material breaks down it releases methane gas (a greenhouse gas) that contributes to climate change. However, when this same waste is composted at home where it has access to oxygen, it decomposes aerobically and it hardly produces any methane which is good for the Earth’s atmosphere. A recent research has found that almost half of the food waste in their rubbish bins could have been composted into nutrient-rich soil. It’s even amazing to know that composting at home for just one year can save global warming gases equivalent to all the CO2 your washing machine produces in around three months, or your kettle produces annually. 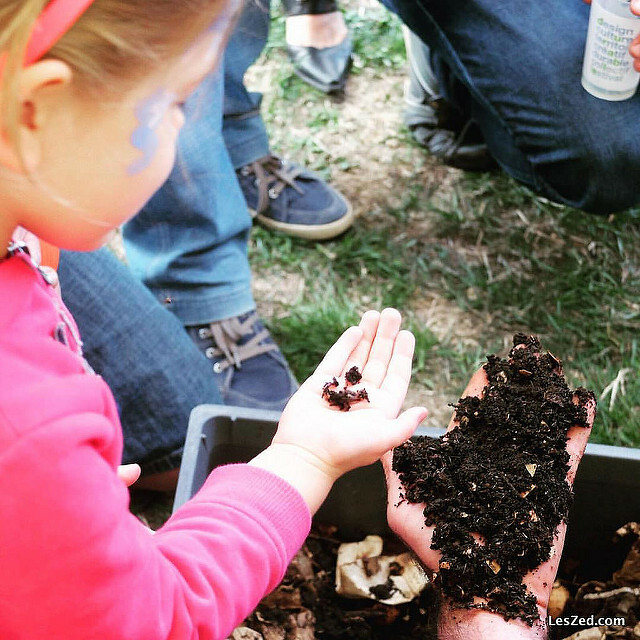 Integrating activities like composting into kids’ lives is a great way to help them to spend more time outdoors, connect with their food, and cooperate as a family. Composting may be work on one hand, but it can also be a fun practice. Moreover, composting is a gateway into gardening – and I can’t think of anything more fun! Some people mistakenly assume that organic matter thrown in the garbage will break down and feed the soil in the landfill. But throwing kitchen and garden scraps in the garbage means they will be surrounded by garbage and not have the proper compost recipe. Therefore, they cannot become a healthy compost for feeding the soil. Healthy compost results from a combination of four ingredients: Brown stuff, green stuff, water, and air. You can mix and match the brown and green stuff that listed below until you find a recipe that works best for you. Just note the carbon-to-nitrogen (C/N) ratio as you build your compost pile. We prefer to use carbon and nitrogen at a ratio of three parts Carbon to one part Nitrogen. You can try it with your kids too. Greens are those with higher nitrogen and are quite wet and heavy. They rot quickly and can get stinky fast unless you balance them out with enough browns. Browns are those with higher carbon and are dry and bulky. They do not decay rapidly without green compost ingredients because they do not hold enough moisture. Moisture makes the best possible conditions for the microbes to break down the material. After adding the greens and browns, water the compost pile and mix it well. You will need just enough water for the compost to be moist, not wet. In dry months, you need to add water, and in wet months you need to keep the compost pile from the rain. Packing layers of brown and green matters into a compost pile is not going to make compost alone. Air needs to be added by turning the compost with a rolling composter or a fork. The compost pile will become warm as the organisms work to break down the organic materials. The heat in the middle of the compost pile can reach up to 150 °F. Turning the compost every few days to introduce more air and more materials from the edges to the middle. Some materials are full of beneficial bacteria, fungi, and worms that will speed up the decomposition process. Add just a small portion of one of these materials to really get the party started. Generally speaking, you can compost almost anything that is organic and was once living. However, not all organic matter is useful. There are a few items that do not decompose well and will hold up the efficiency of your compost pile. So you will want to keep them out of your compost to avoid a hassle. For example, we keep cooked foods, meat, fish scraps and dairy’s out of our compost pile. Although these organic matters can be composted, their smell will act like a magnet for any critters and unwanted pests. We also keep large woody branches and cuttings out of our compost pile since they take too long to break down. Composting is easy to make, but it isn’t simple as just throwing your garden and kitchen scraps into a compost pile and checking on it a year later. Eventually, those organic materials will break down and create compost, but it is much cleaner, faster and more effective knowing the proper step-by-step guide. Are you ready to get outside and work with your kids? Bins have the advantage of being neat, preserving heat and keeping animals out. You can build your own compost bin or you can buy a compost bin from many garden centers. There are many types of bins that you can use to hold organic materials. The size and type of bin you purchase or build will depend on how much organic waste you and your family generate. Choose a site that is sunny and well-drained. Most importantly you should find a site that is easily accessible year round. Place the bin over bare soil rather than paving to ensure that beneficial organisms can make their way into the compost. It’s a good idea to remove any plants and turn the soil to a depth of about 6-8 inches. Collect compostable materials which listed above in containers. You can chop materials into small pieces (the small the better). When they are full, empty their contents into the compost bin. Place a 4″ to 6″ bottom layer of course material such as twigs, dead plant stalks in your composter in order to allow for drainage and aeration. Cover this layer with leaves. The simple alternate layers of garden waste and kitchen waste in 4″ to 6″ increments. Top off the compost pile with 1″ of healthy garden soil or mushroom manure. Whenever you add food scraps or garden waste, be sure to top it with a layer of browns (Carbon materials). If you do not add carbon materials, your compost will be wet and can smell like rotten eggs or garbage. If possible, collect and store dead leaves in a garbage in the fall so you can them in your compost pile year round. There are probably specific ways of maintaining compost depending on the type of compost bin you have chosen. Most of the composters come with instructions inside, follow these instructions for best results. Each layer gets a good sprinkling of water to wet the organic materials. You should wet each layer as you build it. Repeat each of the layers until the bin is full. Once you have a full compost bin, mix and turn the compost every 7 days or so to help the breakdown process and eliminate odor. The more you turn the pile the faster you will have finished compost! It takes anywhere from 3 months to 12 months to produce your healthy compost. The time it takes can vary widely depending on the materials and methods used. Finished compost is dark and crumbly in texture and mostly broken down with a pleasant earth-like smell. To remove the compost, scoop it through the trap door on your unit. Pick out any lumps or pieces of unfinished materials and place them back into the compost bin to continue decomposing. However, for most uses, it is acceptable to have some recognizable pieces of straw remaining. Use your compost as a top dressing for flower beds. Mix compost in with garden soil. Can be spread on your lawn a few times a year.